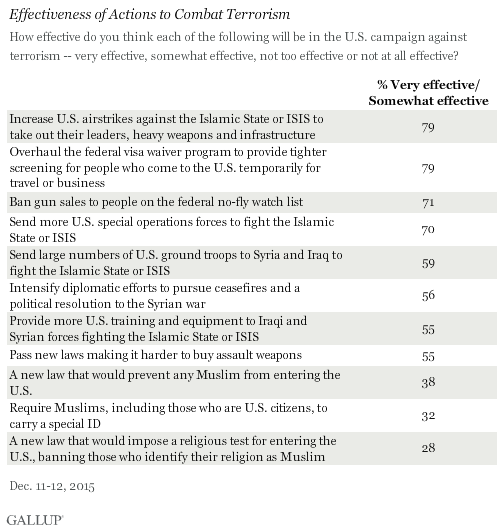 PRINCETON, N.J. -- When asked about 11 ways to combat terrorism, Americans are most likely to say overhauling the nation's visa waiver program and intensifying airstrikes against the Islamic State, or ISIS, are effective measures. Establishing a religious test to ban Muslims from entering the U.S. ranks last. Gallup tested Americans' views of the effectiveness of several current or proposed anti-terrorism measures Dec. 11-12, about 10 days after the Dec. 2 mass shooting in San Bernardino, California, that left 14 dead in what was apparently an attack inspired by Islamic extremism. Since the shooting, Gallup research has shown a sharp increase in the percentage of Americans naming terrorism as the nation's most important problem, as well as an increase in the percentage of Americans who believe it is likely that further acts of terrorism will occur in the coming weeks. At the same time, Gallup has seen a sharp decrease in Americans' confidence in the U.S. government to protect its citizens from such attacks. Aware of this increased public concern, President Barack Obama addressed the nation on Dec. 6, outlining a number of steps to combat terrorism that are either already underway or that he wants enacted. Meanwhile, a day after Obama's speech, presidential candidate Donald Trump championed one of the policies that Obama had rejected in his speech -- instituting a religious test to bar Muslims from entering the U.S. This latest study updated a question format Gallup had originally used in a Sept. 21-22 survey conducted immediately after the 9/11 terrorist attacks. The list included a series of 11 actions the U.S. could take to combat terrorism, most of which Obama mentioned in his Dec. 6 speech in one way or another. Complete results appear at the end of this article. Military options are high on the list. Within that sphere, Americans see the use of airstrikes and special operations forces as more effective than the introduction of ground forces or doing more to arm rebel forces. The study includes four proposals related to the use of military action against the Islamic State. More than half of Americans see all as potentially effective. Intensified use of airstrikes is clearly perceived to be the most effective of the four measured, followed in order of perceived effectiveness by sending more U.S. special operations forces to fight the Islamic State, sending large numbers of U.S. ground troops to fight Islamic State militants, and providing more training and equipment to Iraqi and Syrian forces fighting the Islamic State. While many Americans see the effort to tighten up the visa waiver program as potentially effective in fighting terrorism, the concepts of targeting Muslims by preventing them from entering the U.S. or forcing them to carry a special ID are much less likely to be perceived as effective. Americans view Trump's proposal to ban Muslims from entering the U.S. as the least effective of any of the proposals tested. The survey includes two different wordings of this idea. One wording references a new law that would "prevent any Muslim from entering the U.S." while the second references a new law that would "impose a religious test for entering the U.S., banning those who identify their religion as Muslim." This second wording approximates how Obama described -- and objected to -- the proposal in his speech, and just 28% of Americans believe it would be effective in preventing terrorism. The "religious test" wording scores 10 percentage points lower than the "prevent" wording. Both, as noted, are at the bottom of the list. The question on the effectiveness of requiring Muslims to carry a special ID stems from a proposal Gallup asked about in a different context just after 9/11. This idea -- along with the two wordings of the proposal to ban Muslims from entering the U.S. -- appears at the bottom of the effectiveness list. Overall, the two ideas related to profiling Muslims -- either by preventing them from entering the U.S. or forcing them to carry an ID -- are the only proposals tested whose perceived effectiveness is below 50%. Americans view the idea of preventing individuals on the no-fly list from buying guns as more effective than attempting to limit the sale of assault weapons. Two gun-control proposals are included on the list. Banning gun sales to individuals on the federal no-fly list is among the four most effective proposals tested, with a 71% effectiveness rating. Americans perceive new laws making it harder to buy assault weapons as less effective, at 55%. Democrats see gun control as most effective, while Republicans see visa overhaul and military operations as most effective. There are differences in the ways in which Republicans and Democrats rate the effectiveness of the proposals. The top four most effective proposals according to Republicans and Republican-leaning independents include reforming the visa waiver program and three military options -- increased airstrikes, more special operations forces and introducing U.S. ground troops to fight Islamic State militants. For Democrats and Democratic leaners, the two most effective proposals relate to gun control -- barring those on the no-fly list from buying guns, and limiting the sale of assault weapons -- followed by airstrikes and reforming the visa waiver program. The biggest distinction across party lines comes in views of banning assault weapons, with 78% of Democrats viewing it as effective, compared with 31% of Republicans. There is also a 26-point difference between Republicans and Democrats in the perceived effectiveness of preventing Muslims from entering the U.S., with Republicans more likely to see it as effective. Still, this proposal ranks fairly low on Republicans' list. American government leaders have no shortage of possible options to use in the battle against acts of terrorism in the U.S., and presidential candidates running for office themselves have no shortage of ideas about what they would do if elected. As far as the American public is concerned, a number of different options would be at least somewhat effective in combatting terrorism -- including, in particular, tightening up the nation's visa waiver program, intensifying airstrikes against the Islamic State, banning individuals on the government's no-fly list from being able to buy guns, and sending more special operations forces to fight Islamic militants. Notably, less than half of Americans think proposals to profile Muslims, either by preventing them from entering the country or by requiring them to carry special identification, would be effective. Results for this Gallup poll are based on telephone interviews conducted Dec. 11-12, 2015, on the Gallup U.S. Daily survey, with a random sample of 1,016 adults, aged 18 and older, living in all 50 U.S. states and the District of Columbia. Each item was asked of approximately half the sample, with item selection determined at random. For results based on the national adult sample rating each item, the margin of sampling error is ±5 percentage points at the 95% confidence level. All reported margins of sampling error include computed design effects for weighting.